Tea tree oil has natural antifungal properties that can effectively treat jock itch along with other types of skin infections. It also has deep cleansing and stimulating elements along with a powerful antibacterial quality. It will also help alleviate itchiness and inflammation associated with jock itch. Use a cotton ball to apply tea tree oil to the affected skin twice daily. Continue for a few days until the symptoms disappear completely. If it causes a lot of burning sensation then you can use mix four or five drops of tea tree oil in one tablespoon of coconut oil and then use it. Another option is to add a few drops of tea tree oil to your bath water and soak in it for about 15 minutes. You can also use soap or shower gel containing tea tree oil. 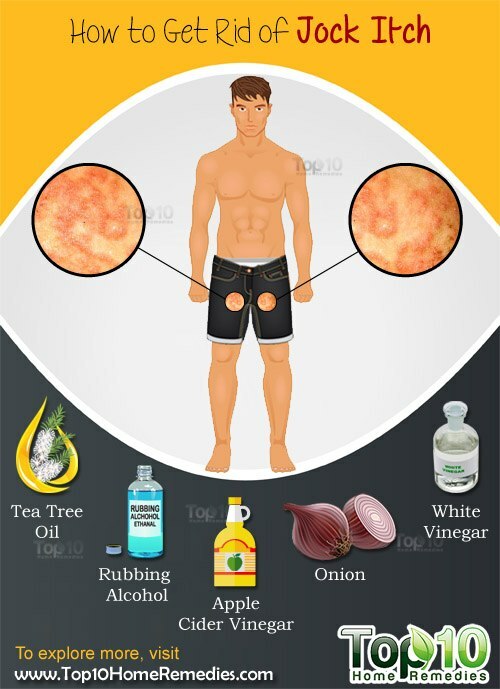 Washing the infected skin with diluted apple cider vinegar is a great way to deal with jock itch. Apple cider vinegar has strong antifungal and antibacterial properties to cure and control various skin infections. Mix two tablespoons of apple cider vinegar in two cups of warm water. Wash the infected area with this solution and allow it to dry on its own. Repeat this process two or three times daily, especially before going to bed. Rubbing alcohol is another effective home remedy for jock itch because it kills the fungus causing the infection. Plus, being a drying agent, it helps keep the affected area dry; fungi thrive in warm, moist environments. Dip a cotton ball in 90 percent isopropyl alcohol. Dab it on the affected area. You need not wash it off as the alcohol will evaporate quickly. Do this a few times daily until you are satisfied with the results. Listerine is an excellent home remedy for fungal infections like jock itch and athlete’s foot, thanks to its antiseptic, antifungal and antibacterial properties. Use a cotton ball to apply the amber Listerine mouthwash on the affected skin and leave it on until it dries completely. Initially it will hurt, but you will soon get relief from the soreness and inflammation. Repeat three or four times daily for a few months for complete relief. Note: Do not use Listerine on open wounds. White vinegar can also help greatly in dealing with a skin infection like jock itch as it has antifungal and antiseptic properties. Mix one part of white vinegar and four parts of water. Soak a washcloth in this solution and use it to wash the affected area, gently and thoroughly. Allow the solution to dry on its own; you need not rinse it off. Repeat once or twice daily. Another option is to apply a mixture of equal parts of white vinegar and coconut oil on the affected skin. Leave it on for a few hours before washing it off. Do this twice daily until you get rid of the problem. Bleach has antiseptic, antibacterial and antifungal properties that help treat jock itch. Mix one-fourth cup of bleach in a bathtub full of water. Soak in it for about 15 minutes daily or every other day, depending upon the severity of the condition. Be sure to pat dry your skin after your bath as moisture can worsen jock itch.